Following oral ingestion, but also after the systemic administration, opioids also bind to selective receptors located within the intestinal tract. The physiological significance of peripherally located opioid binding sites within the intestine is that of regulation of the propulsive transit. The intestine with a total surface of nearly 400 m2 is an underestimated important anatomical site as it has a high accumulation of neuronal tissue, which has been termed the enteral nervous system (ENS), which acts like a second brain. Since there is a close interconnection of the ENS with the CNS via the vagus nerve, regular impulses to and from the ENS are being exchanged. Anatomically the intestine is surrounded by two separate syncytial, netlike nervous structures. One is the myentericus plexus (Auerbach) located between the longitudinal and the circulatory muscle fibers (Figure II-60). 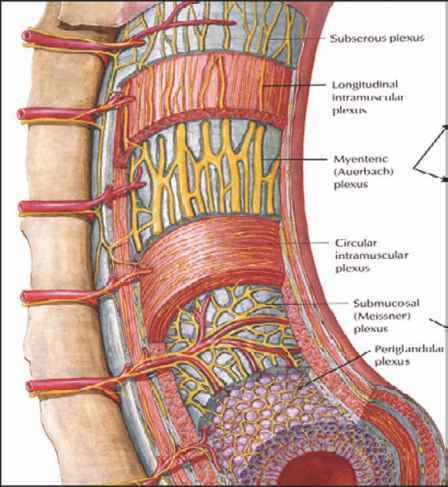 The second is the submucosal Meissner plexus, located between circulatory and the submucosal muscle fibers. Within the Auerbach plexus of the intestinal tract, there is a balance between the cholinergic and enkephalinergic neurons: Binding of systemically applied opioids to enkaphalinergic receptor sites results in an inhibition of transit followed by constipation. Contrarily, cholinesterase inhibitors induce an accumulation of acetyl-choline at ACh-receptors with an increase in motility and an enhancement of transit. Presently, however, not very much is known of the long-term effect of central analgesics on opioid-receptors within the myenteric plexus, and if opioid ligands induce only a constipating effect, whether they also depress the immune system in the intestine or result in a distress the neuroregulatory and endocrine function.